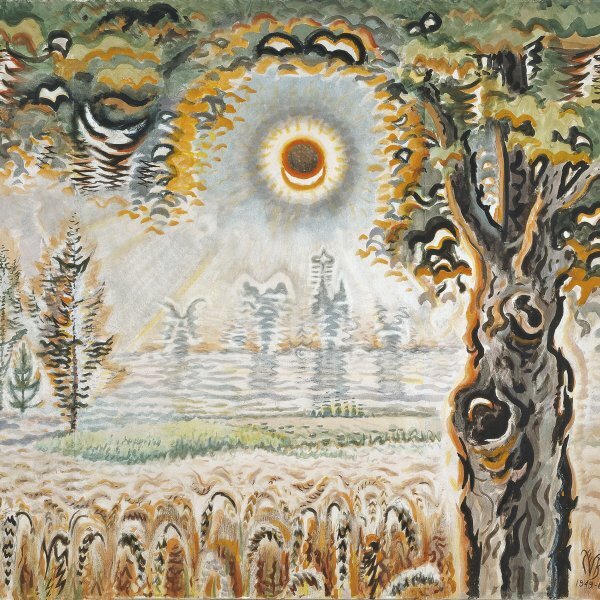 On 17 November 1933 Charles Burchfield wrote in his diary, “The other night I lay awake, tortured by a multitude of thoughts; outside the sky was blanketed with soft strangely luminous clouds, in which now and then appeared ragged holes thru which glowed the deep indigo sky – black.” As may be inferred from both his writings and his paintings, Burchfield, who was well versed in astronomy, felt a special attraction for the sky and heavenly bodies — not only the sun and moon but also the Pleiades and certain constellations of stars, particularly Orion, which appears in winter. Executed in 1962, Orion in Winter, a fantasy scene that may recall Van Gogh’s Starry Night, is an appealing nocturnal view in which the moon and stars shine through the darkness and illuminate the whiteness of the snowy landscape. 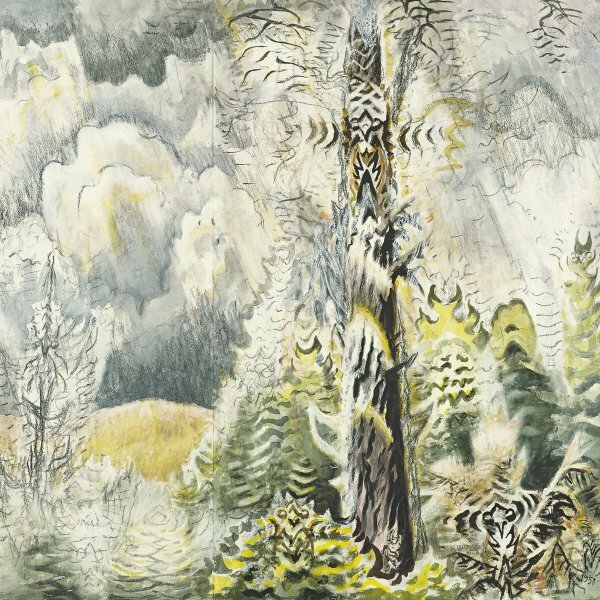 In 1962, Burchfield stated that it was based on the countless sketches he had made in 1917, his “golden year, ” during his experiments with the visualisation of sounds. The gleam of the moon’s halo — the ring that can be glimpsed on certain nights owing to the effect of the refraction of sunlight — and Orion’s reddish halo crowning the composition stand out against the dimmer light of the other stars. 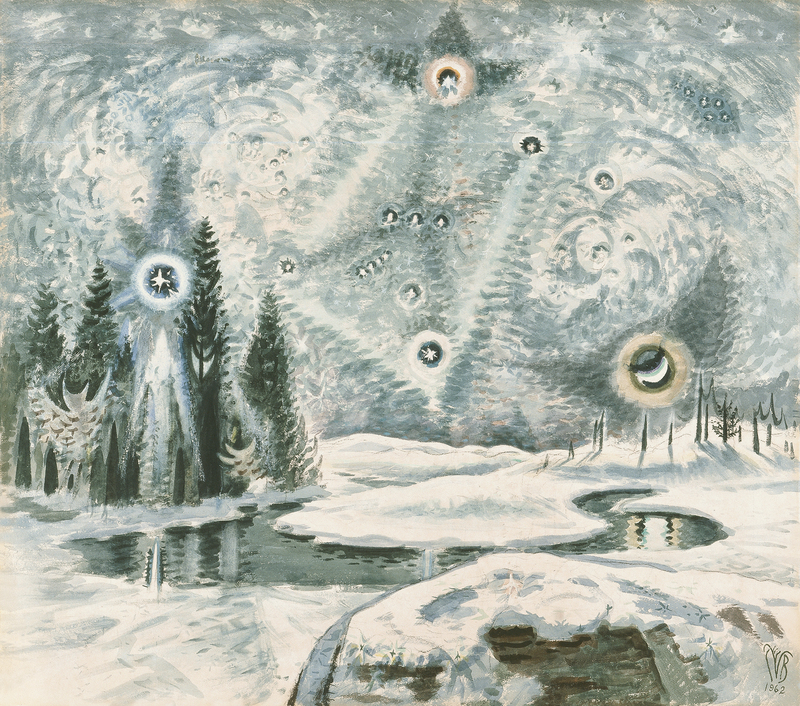 The reflection of the moon and stars is also visible in the black waters of the stream located further into the background. The use of images is only granted for private or educational/academic purposes. Use for educational purposes is defined as the non-commercial and non-advertising use of images in presentations, lectures, school or university projects, and academic or research publications of which no more than 1,000 not-for-profit copies are printed. The material may not be reproduced without first obtaining a licence from the author of the work or from the corresponding copyright holder (described in paragraph 6). The reproduction of the images made available free of charge by the Fundación Colección Thyssen-Bornemisza for the purposes described in paragraph 4 are protected by copyright. The material may not be reproduced without first obtaining a licence from the author of the work or from the corresponding copyright holder. The material may not be reproduced without first obtaining a licence from VEGAP, (for more information go to www.vegap.es). Any previously licensed reproductions of the copyrighted images, whether in part or in whole, must mention the copyright holder and the following note: Provenance: Thyssen-Bornemisza Museum.